Something that I struggled wrapping my head around when learning Next.js was refreshing data on a given page. It seemed that the only option was to trigger the browser to reload the page, which isn't at all what I was going for. Next.js does a fantastic job of populating the page with data, whether it's rendered on the server or in the browser. The initial page data and the plumbing needed to fetch it is something I just don't need to think about. The getInitialProps() function fetches the data that our page needs. It makes a fetch() call to some imaginary API endpoint, gets the JSON response by calling response.json(), and returns an object with a myFetchedData property. The object that is returned is passed to the MyPage component as props. You can see that our component uses the props.myFetchedData value when rendering its content. Finally, the getInitialProps() function is assigned to MyPage.getInitialProps. This is how Next.js knows how to populate our page data. It will call this function on the server if this page is requested, or in the browser if this page is navigated to after the initial load. At this point, we have a page that loads data on initial render. But what happens if the data returned by the API endpoint has changed somehow? For example, some other component in our application changes this value or creates a new resource, etc. There are any number of reasons that you might want to refresh the data that's passed to MyPage as properties. This is where I got stuck. The MyPage component now has myFetchedData as state. The original myFetchedData property is still passed to the component because this is how the Next.js mechanism for data fetching passes data to our components. However, the useState() hook uses the myFetchedData property value as default state value for the myFetchedValue state. This means that you don't need to worry about the myFetchedValue property - just use the myFetchedValue state instead since it has the same value. Now that we've setup myFetchedValue to be stateful, we can implement a proper refresh function. But first, take note that we've renamed the getInitialProps() function to fetchData() because it's now more generic than fetching the initial page data. The refresh() function calls fetchData(), then calls setMyFetchedData() to update the state and re-render the page. The default value passed to useState() is the value that is fetched initially by Next.js. You can reuse your data fetching function any time you need fresh data. Just update the state when you have the new data. The choices array represents the choices that we have available. The name property isn't actually used for anything in this code. The value property is what we're interested in here. We want to run some code if any value is true. In this case, the else path is followed because not every value is true. The _.some() and _.every() functions are helpful with simplifying the conditions evaluated by if statements. For example, _.some() provides the same result as chaining together a bunch of logical or (||) operators. Likewise, _.every() replaces logical and (&&) operators. The result is that instead of having to maintain the condition that's evaluated in the if statement, we can simply add new values to the choices collection. Essentially, this is a step toward declarative programming, away from imperative programming. Let's think about the if statement used above, and what it's actually doing. It's calling console.log() when some condition is true, and it's calling console.log() again when the condition is false. The problem with if statements like this is that they're not very portable. It'd be much easier to call a function with the possible choices as an argument, and the correct behavior is invoked. We've created a higher-order function called some() that returns a new function. The returned function accepts an arbitrary number of values. These are tested with Lodash's _.some(). A Map is used in place of an if statement to call the appropriate logging function. Now any time that you want an if statement that evaluates simple boolean expressions and runs one piece of code or another, depending on the result, you can use some() to compose a new function. You then call this new function with the choices as the arguments. The only difference between every() and some() is that we're using _.every() instead of _.some(). The approach is identical: supply yes() and no() functions to call depending on result of _.every(). Lodash has a _.cond() function that works similarly to our Map approach in some() and every(), only more powerful. Instead of mapping static values, such as true and false, to functions to run, it maps functions to functions. This allows you to compute values to test on-the-fly. The _.flow() function creates a new function by calling the first function, then passing it's return value to the next function, and so on. The _.rest() function creates a new function that passes argument values as an array to it's wrapped function. We're doing this with _.some() because it expects an array, but we just want to be able to pass it argument values instead. The _.cond() function takes an array of pairs. A pair is a condition function, and a function to call if the condition function returns true. The first pair that evaluates to true is run, and no other pairs are evaluated. The _.partial(_.eq, true) call makes a new function that tests the output of _.some(). The _.stubTrue() function will always evaluate to true, unless something above it evaluates to true first. Think of this as the else in an if statement. We can use this new implementation of some() to compose the same hasSome() function that we created earlier and it will work the same way. Likewise, we can implement the every() function using the same approach. For something as simple as the some() and every() functions, the _.cond() approach doesn't present any clear advantage over the Map approach. This is because there are exactly two paths. Either the condition evaluates to true, or it doesn't. Often, we're not working with simple yes/no logical conditions. Rather, there are a number of potential paths. For each of the condition constants that we defined above, we're using the _.constant() function in _.cond(). This creates a function that just returns the argument that is passed to it. As you can see, console.log('Condition 2') is called because the function returned by _.constant(condition2) returns true. It's easy to add new pairs to _.cond() as the need arises. You can have 20 different execution paths, and it's just as easy to maintain as 2 paths. When doStuff() is called the first time, the console.log('Condition 3') path is executed. Then, we change the state of app so that condition1 is true and condition3 is false. When doStuff() is called again with app as the argument, the console.log('Condition 1') path is executed. So far, we've been composing functions that use console.log() to print values. If you write smaller functions that return values instead of simply printing them, you can combine them to build more complex logic. Think of this as an alternative to implementing nested if statements. These functions themselves follow the same implementation approach, using _.cond(). For example, cond1() will return the string 'got 1' or 'got 2', depending on the number supplied as an argument. Likewise, cond2() will return 'got one' or 'got two', depending on the string argument value. Using _.cond(), you can compose complex logic by reusing existing functions. This means that you can keep using these smaller functions where they're needed, and you can use them as pieces of larger functions. I'm pleased to announce the availability of Learning jQuery 3. This is the fifth edition of the book, and given its track record, I didn't want to diverge from what has worked so well over all these years. 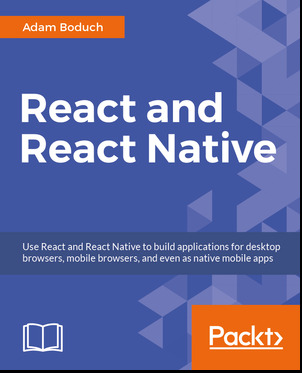 I'm pleased to announce that my latest book, React and React Native is now available.